Cheers, Allentown! Start your evening at the museum with good spirits and good friends in our upstairs Art Ways area. County Seat will be providing samples of some of their many varieties of spirits and a signature cocktail to kick the night off. Must be at least 21 years of age. Celebrate the festival of colors right outside the Museum, on Fifth Street (weather permitting). Join in the fun by throwing colored powder in the air and on one another to celebrate the arrival of spring. (Bring a white T-shirt that can get covered with color!) Then enjoy a high-energy Bhangra dance by the Pennsylvania Bhangra Club. Drop-in and join a free workshop with artist Femi J. Johnson. Use paint and collage to explore issues of identity in relation to Carrie Mae Weems: Strategies of Engagement. Bring your own photograph, memento, or imagery from home to incorporate into your artwork if you’d like. 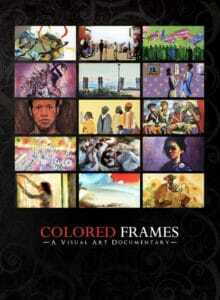 A look back at the last fifty years in African American art, Colored Frames is an unflinching exploration of influences, inspirations, and experiences of black artists. Beginning at the height of the Civil Rights Era and leading up to the present, it is a naked and truthful look at often ignored artists and their progenies. No reservation is needed to join this free tour of our special winter exhibition–just drop in! Test your knowledge and win prizes every Third Thursday with our Arts and Culture Trivia. Questions span from 16th century art to contemporary culture, and prizes are awarded at the end of each round. Student dancers enrolled in the Muhlenberg Dance Program will engage with works of art throughout the Museum through individually choreographed dances that highlight the dynamic relationship between the performing and visual arts. Two performances, at 6 and 6:45 p.m.